Chef Fernando Villagomez brings authentic interpretations of spicy Mexican fruit cups, licuados (fruit shakes) and aguas frescas to the Grand Central Market. Villagomez, who has three eateries at L.A.’s iconic food hall, also makes exotic fruit bowls with a combination of condensed milk and Mexican crema and topped with shredded coconut, raisins and granola. The newly built Mexican-tiled stall is near the Broadway entrance to the Market. It’s open from 9 a.m. to 6 p.m. Monday through Thursday and 9 a.m. to 8 p.m. Friday and Sunday. 317 S. Broadway, (213)624-2378. For the fourth year, TAO Group kicks off a nationwide effort to support and shed light on World Autism Awareness Month in April. Throughout the entire month, new blue-themed dishes will be added to menus at TAO Group properties across the United States, including the bluefin tuna maki roll with enoki mushrooms, black truffles and a soy dipping sauce for starters, the 24-ounce aged prime T-bone steak served with Szechuan potatoes, chili caramel sauce and scallion kakiage for entrées, and a giant blue fortune cookie topped with white and dark chocolate mousse for dessert. TAO is also adding a new signature cocktail, the blue “Light It Up” Bramble, which is made with vodka, blueberry jam, fresh lemon and simple syrup. TAO restaurants will donate 10% from each cocktail sold to their partner organizations, and 10% of proceeds from select bottle sales will be donated to TAO Group’s Autism Awareness campaign. Participating properties include TAO Asian Bistro at 6421 Selma Ave., (323)593-7888, Beauty & Essex at 1615 Cahuenga Blvd., (323)676-8880, The Highlight Room at 6417 Selma Ave., (323)366-8007, and Luchini Pizza and Bar, 1607 Cahuenga Blvdl., (323)593-7771. On Sunday, April 7, enjoy a multi-course “Goin’ Dutch” farmers market supper to celebrate L.A.’s leading farmers market cocktail expert, Christiaan Rollich at Lucques. Dishes include soused herring with fava beans, crème fraiche, pickled shallots and rye toasts. Next is a local halibut with sauerkraut potatoes, curly kale, rookworst (Dutch sausage) and a bacon vinaigrette. The slow-roasted veal loin is served with greens, gouda and Belgian endive wrapped in ham. Finish with bossche bollen (large profiterole) with coffee ice cream, chocolate sauce and speculaas (spiced shortcrust biscuit) crumble. For an additional $35 per person, enjoy cocktail pairings with each course. This special meal includes a meet and greet with Rollich, where he will be available to personalize copies of his new book, “Bar Chef.” Books will be on sale separately. 8474 Melrose Ave., (323)655-6277. New at Dodger Stadium is the Dodgers Blonde Ale (4.8% ABV) brewed with Bravo and Cascade hops from Golden Road Brewery. The finished result is a deliciously crisp and smooth blonde ale that can be enjoyed by fans at Dodger Stadium. The Dodgers Blonde Ale is also now available in 25-ounce cans at retailers across Southern California. Fans can stop by the Golden Road pub for a pint on tap. 5410 W. San Fernando Road, (213)373-4677. The Garland is celebrating spring on Sunday, April 7, from 2 to 5 p.m. Enjoy a complete block party offering a variety of new activities such as lawn games, a pop-up shopping soireé, live music and gourmet samplings prepared by Executive Chef Larry Greenwood. 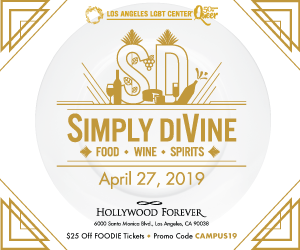 Sip some of California’s best breweries and wineries including 10 Span Vineyards, Ballast Point Brewing & Spirits, Landmark Vineyards and Knee Deep Brewing Company. The Garland is giving back to Wildlife Waystation, a private animal sanctuary that provides 24-hour care to nearly 500 permanent animal residents. Donations of unsalted shelled nuts, sunflower seeds, coconut flakes, raisins and oats ‘n honey granola bars are welcome. Tickets are $29 per person and can be purchased online at Eventbrite or $38 per person at the door. 4222 Vineland Ave., (818)980-8000. Rocco’s Tavern will show all of the Los Angeles Dodgers games and offer food and drinks specials. Rocco’s has been in Los Angeles since 2000 with locations in Studio City, Pasadena, Culver City and Westwood, and a West Hollywood location with partner Lance Bass will open soon. Rocco’s signature dishes include wings, pizza, salads, pasta and hero sandwiches, as well as a full bar and beer specials. 12514 Ventura Blvd., (818) 985-9876; 44 W. Green St., (626)765-6810, 3843 Main St., (310)559-5500; and 1000 Gayley Ave., (424)248-3145. Due to construction taking place nearby, the restaurant is closed and will reopen in early May. Stay tuned for updates about the restaurant just in time for summer. 330 S. Hope St., (213)680-0330. Hidden in the back of the beachside culinary destination is the hip whiskey bar named Grain. “Top Chef” Winner Brooke Williamson and her husband Nick, along with lead bartender Taylor Hall, pull inspiration from SoCal’s best ingredients for an ever-changing, seasonal menu. Grain boasts more than 200 different types of whiskey, Scotch and bourbon, as well as the couple’s in-house, barrel-aged proprietary. Spirit enthusiasts and whiskey newcomers alike will enjoy new crafted cocktails or classics like in-house barrel-aged old fashioneds, Sazeracs and Manhattans. Save the date on April 29 for an evening of Ardbeg flights and gourmet bites for $55 starting at 7 p.m. For tickets go to playaprovisions.com. 119 Culver Blvd., (310)683-5019. 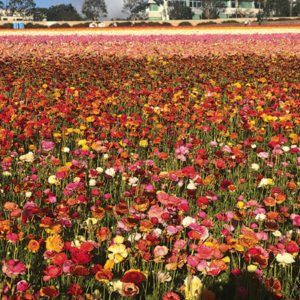 Acres of colorful ranunculus blanket the hills in Carlsbad from now until Mother’s Day weekend. The Flower Fields offers special events that include Tea in the Gardens, arts and crafts, and weekly food truck fare by Organic Food Truck, Sushi Ono, Cousins Maine Lobster, Z’S Buddies Sushi and more. Dang Brother’s Pizza’s uses a wood-burning oven imported from Italy that is built into the back of a firetruck and will be making pizzas to enjoy on April 14, 21 and 28. Premium wines and food bites are offered on Fridays, April 5, 12 and 19. There will be live musical performances from 6 to 7:30 p.m. Wine and food education is offered by sommelier Lamar Engel of The Wine Militia. Guests for this event must be 21 and older. Tickets are available on Eventbrite at $65 per person plus a fee. For a schedule of events, go to theflowerfields.com/attractions-and-events/2019-calendar-of-events/. 5704 Paseo Del Norte, Carlsbad.